You’ve just entered the world of entrepreneurship, and you want to take your industry by storm. You know you have tons of competitors, and you have a challenging task ahead of you. So you’re looking for the best ways to achieve your goals, and to do so quickly. This is where these tips about content marketing for startups can help you. In the simplest terms, content marketing for startups is the art and science of creating and distributing content for promoting your startup. Read on to learn eight of the most effective tips for content marketing for startups and new entrepreneurs. In this post, you’re going to find some useful tips about content marketing for startups that will help you develop an effective content marketing strategy. You’ll learn about the most effective techniques for content creation and distribution. If you’re just starting out, it’s likely that you’re a bit lost on what kind of content to create. As a fail-safe, you can try picking out ideas from content that is already successful. In other words, research what has worked on your target audience before to come up with topic ideas. 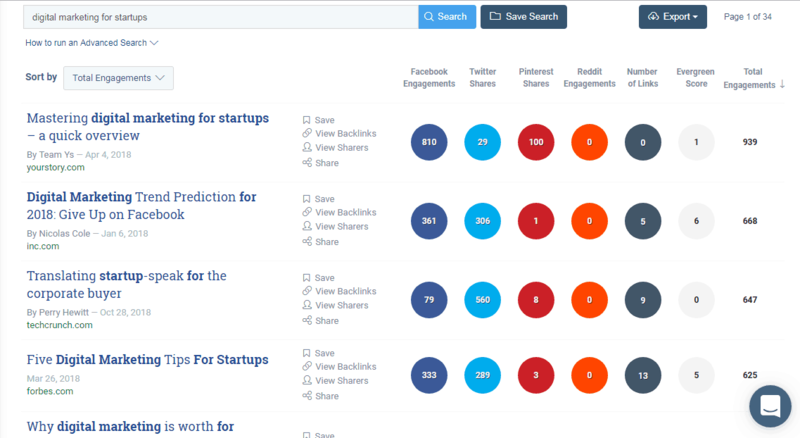 You can use tools like BuzzSumo to find trending and popular topics. The tool lets you discover which articles have been shared the most, or which are currently trending. You can filter the results according to timeline and content type. If you want, you can also find out the most popular articles in a particular domain. And then you can implement these ideas into your content marketing strategy for startups. The goal is to create something completely fresh based on these results. What you create should be more useful, and more interesting than the article from which you derived your idea. For example, you find that an article providing stress-relieving tips for entrepreneurs is performing well. You could write a more detailed article providing step-by-step exercise instructions and recipes for stress-relief. Or you could turn popular text content into something more captivating, such as an infographic or an informative video. New entrepreneurs and startups struggle with building an audience. You may be an expert in your niche. But if you don’t have an audience to see that, it may be challenging to market yourself, and execute your content marketing strategy for startups. This means you’ll have to choose a different channel that will help you reach an established audience. Your best option is to connect with reputable, high-authority sites that already have loyal readers. The goal is to submit guest posts to these sites, which will provide you with valuable backlinks, and drive traffic to your site. And you’ll help them by supplying fresh content to their blog. Guest blogging has been proven to boost growth in a number of ways. For instance, Ahrefs highlighted some case studies in which entrepreneurs have used guest blogging to improve their performance. One boosted search traffic by 20%, and another hit the first page of Google. Let’s say you’re in the financing industry, and your main focus is on startups. For a content marketing strategy for startups, you’ll need to find websites that provide guest posting opportunities and cater to startup business owners. 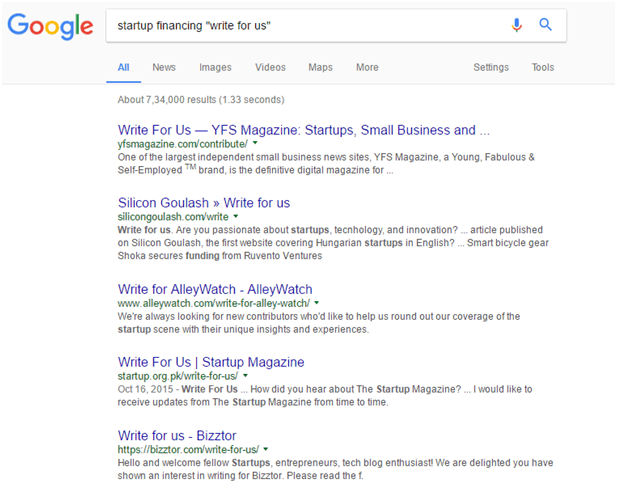 You can use search terms like “startup financing ‘write for us,’” “startup ‘contribute,’” etc. to find potential host websites. You can then shortlist the best websites to contribute to by checking their Domain Authority. Domain Authority is a rating that determines the website’s reputation and quality. The higher a website’s DA is, the better visibility your guest post will have. The Domain Authority Checker by Small SEO Tools is easy to use for beginners and experts alike. When you scroll through your Facebook newsfeed, which of these would more likely catch your eye—a lengthy text post about a topic you like or an eye-catching infographic relaying the same information? If you choose the infographic, you’re not alone. A picture is more likely to attract people. And people can process visual content much easier than text content, which is a phenomenon known as the Picture Superiority Effect. So, content marketing for startups should involve producing the occasional infographic, meme, graphic, or video besides your usual blog posts. You can easily share this type of content through both social media channels and email. On the other hand, if you only share article links you might find that some people aren’t bothered to click on the link. A good example of the importance of visual content is how the search for “infographic” has increased gradually over the years. 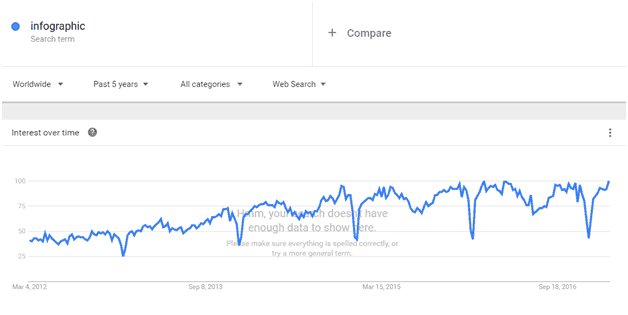 As you can see in the screenshot below, Google Trends shows that there has been significant growth in the number of searches for the term over the past five years. In fact, infographics are so powerful that the Sumo team experienced a 400% growth in revenue after implementing an infographic strategy. Consistency is crucial for the success of any content marketing for startups. You need to produce content on a regular basis, and prove to your readers that they can trust you. It may not be possible to create a new blog post every day, especially if you want quality content. But you should have a content schedule in which you have a new blog post every week or so. You could even make it a point to try to post at least two new blog posts every week. And you can send out a weekly digest like Inbound does to keep your subscribers updated on new blog posts. This way, you can attract readers who don’t check your site regularly, but who do subscribe to your weekly digest. Influencers are people who have built a reputation for themselves in a particular niche or industry. They are known as subject matter experts and are considered trustworthy sources of information. People listen to what they have to say and they can often influence people’s decisions. One of the best ways to get influencers to notice you and your content is by mentioning them in the content. For example, you find a blog post by an influential expert in your industry. It inspires you to write something related to it. You can link to them in the post, and mention how their post inspired you. Or you can recommend their post as a further reading to your audience. After this, you can share it on social media, and tag the influencer. You can also send an outreach email to them, to share the link, and thank them for inspiring you. 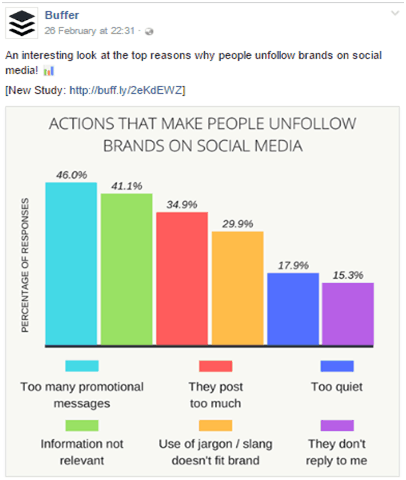 These are just a few ideas for how to get influencers to notice your content. The goal is to have them share the post with their followers. And linking to them can also boost your link profile, which is important for any content marketing strategy for startups. 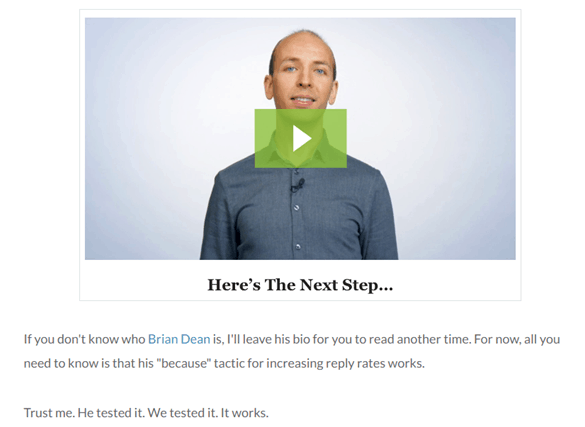 Here’s an example from a Moz article written by Sean Martin. As you can see in the screenshot below, the writer has mentioned Backlinko’s Brian Dean and linked to one of his articles. Sean could go a few steps further and share the article with Brian, which might catch the influencer’s attention. Influencers already have an established audience. And to get that audience to read your posts, you could create content that implements the influencer’s insights. An excellent way to pull this off is through roundup posts. You choose a topic and then reach out to various industry experts for their opinions. Not only will this help you build strong relationships with people who matter, but it will also enrich your website. It’s a chance to provide your readers with fresh and engaging content, which is crucial for a successful content marketing strategy. And the experts can then share the post with their audiences, which will drive traffic and engagement to your site. Even if you can’t reach out to the influencers, you can still create a roundup post by collecting and curating their content. For example, you could pick a topic, and search for the most shared, and trending articles related to the topic. You could then create a post mentioning their expert advice and tips. 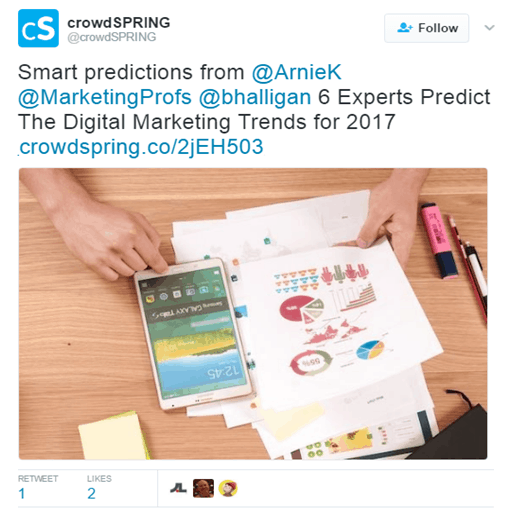 Crowdspring created an expert roundup post of digital marketing trend predictions for 2017. They included predictions from reputable experts like HubSpot’s Brian Halligan and Vertical Measures’ Arnie Kuenn. Crowdspring then shared the post through social media and tagged some of the experts who were included in the post. Another excellent way to enrich your content, and reach an influencer’s audience is by interviewing relevant influencers. This is somewhat like the expert roundup posts, except that you dedicate one post for each influencer. The influencer could promote the interview with their audience, driving them to your site. And you also build a relationship with the influencer. Here’s an example of an influencer interview conducted by Styla. The Styla blog posted an interview with reputable digital marketer, Neil Patel. The post contained useful tips for entrepreneurs and marketers, which could be beneficial for Styla readers. Social media marketing and content marketing for startups should go hand in hand. When you produce new blog posts, many readers may not notice because they don’t regularly check your blog. But you can reach those readers by promoting the content on social media channels like Facebook, LinkedIn, etc. There’s no denying that you need social media to perfectly execute content marketing strategy for startups. Social media posts usually have a preview image when you share a link. But this may not be enough to entice people to click on the link to read the entire blog post. Instead, you could follow Buffer’s footsteps and create an image to explain a few points in the post. Then you can add a link to the full blog post in the caption/description. In other words, you’ll be giving people an actual preview of the blog content. You can further boost the post’s visibility by using paid promotions. Through boosted posts, you can attract audiences similar to your existing followers. They may have never heard of you before, but it might stir their curiosity when they see the sponsored post on their newsfeed. As a startup, you can set yourself apart from the big players by writing about niche topics that are not that well-covered in your industry. Instead of competing with everyone else for broader topics, you can choose to show your expertise in your niche. This has three advantages—it will reduce the level of competition that you face, establish you as an authority in your niche, and make your brand stand out in the crowd. The key to finding niche topics in your industry lies in being as specific as possible. If you have a digital marketing startup, instead of writing content on the broader topic of “digital marketing” you should focus on “digital marketing for startups.” If you have a local business, you can make your content even more specific and write about topics of relevance to digital marketing startups in your region. Another great way of finding niche topics is to focus on long-tail keywords while doing a keyword research. One quick way of doing this is using Google auto-complete feature. Just start typing the name of your industry or product niche and Google will give you suggestions on specific, long-tail keyword searches for the same (see example below). You can also use a keyword-finder tool like BuzzSumo but focus on long-tail keywords instead of short ones. This will provide you with a list of trending topics for your niche. You can also scroll down the list and look for topics that are not that well-covered and write about those. Timing is another important aspect that can affect the success of your content. Your target audience won’t be online all day, every day. There are times and days when they’re most active, which would ideally be the best time to post content. So when you’re tweeting the link to your new post, or you’re sharing a new infographic on Facebook, choose the time of day when your audience will most likely notice. 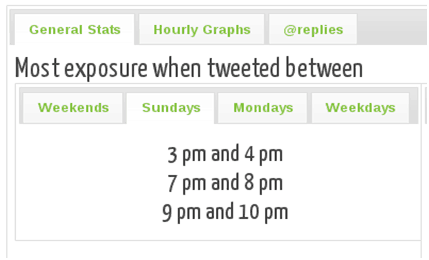 You can use tools like Tweroid to research your Twitter followers and see when they’re most active. This can give you a pretty good idea when they’ll be active on other social media channels as well. You can then time the tweet or post accordingly. If you’re not going to be online at that time, you can schedule the post to be shared during the optimal time. These eight effective tips for content marketing for startups can help you excel at your content marketing efforts. As you can see, these tips for content marketing for startups are easy to use and, hence, are suitable for both novice and seasoned entrepreneurs. It all comes down to knowing what your target audience likes and distributing the content through channels they frequent. Have you applied any of these tricks for content marketing for startups before? Or do you have any questions about how you can start using them for designing a content marketing strategy for startups? Let me know in the comments below. And if you need any help with improving or distributing your content, feel free to get in touch with me. Thank you, this information is very useful and easy to implement.